Tacoma, WA – Tacoma Art Museum (TAM) is pleased to announce that on January 19, 2019, it will open its doors to the public to celebrate the new Rebecca and Jack Benaroya Wing. “We wish to celebrate the opening of the new Benaroya Wing and provide TAM’s closest supporters and community partners the exceptional experience of seeing the new Benaroya Wing first,” says David Setford, TAM Executive Director. “We feel very fortunate and honored to be entrusted with this remarkable new Wing and look forward to sharing this gift with our visitors and our community.” Museum members will have the first opportunity to experience the new wing on Sunday, January 13 where private tours and events will be scheduled to kick off the pre-opening week festivities. The January 15-18 pre-opening week festivities will include private tours and special events for TAM’s museum and corporate partners, community partner organizations, and educational institutions. Rebecca Benaroya originally promised 235 works of art and provided $9.2 million for the construction of the gallery. In December 2017, Rebecca Benaroya promised an additional 118 artworks. The Benaroya Collection now totals 353 works of art. “This additional gift demonstrates Becky’s extraordinary generosity. We are honored once again to be the museum that will share these spectacular artworks,” said David Setford. The new gift includes major works by Howard Ben Tré, Dale Chihuly, Gregory Grenon, Michael Lucero, Jesus Bautista Moroles, William Morris, Seth Randal, Ginny Ruffner, Julie Speidel, Cappy Thompson, and Toots Zynsky. “This promised gift deepens TAM’s holding of iconic artists—most of whom have important connections to the Pilchuck Glass School. These works illuminate the importance of Pilchuck to the history of American art,” says Rock Hushka, Chief Curator and Deputy Director of TAM. This transformative gift advances TAM’s amibtion of building a premier collection that tells the story of the Northwest artistic identity in all its richness and complexity. Tacoma Art Museum continues to collaborate with the renowned Museum of Glass, known for its daily Hot Shop demonstrations featuring emerging and acclaimed Visiting Artists, glass art exhibitions, and engaging educational and community programming, all to position Tacoma as an international epicenter of studio glass art. The Benaroya gift enhances this focus as a local and national draw for studio art glass lovers, with the Chihuly Bridge of Glass connecting Tacoma Art Museum and Museum of Glass. reinstallation of new exhibitions, and will feature a 46-foot sweeping window overlooking the historic Prairie Line Trail, mirroring the Mayer Sculpture Hall in the Haub Family Galleries. A generous Building for the Arts grant of $1.02 million, funded by the taxpayers of Washington State, is being used for the integration of the Benaroya Wing into the existing TAM campus. The project totals just over $10.19 million, providing a boost directly to the local economy. The Rebecca and Jack Benaroya Collection has been hailed as one of the most prestigious private collections of studio glass art in the United States. This gift places Tacoma Art Museum into one of the top five public collections of studio glass nationwide with this focus, adding to the holdings from the other influential collections including those of Anne Gould Hauberg, Paul Marioni, and Dale Chihuly. Rebecca and Jack Benaroya have been major benefactors for cultural, educational, and medical organizations in the Pacific Northwest. The Benaroya’s provided the seed money to help launch the Seattle Symphony's much-lauded performance venue, Benaroya Hall, which opened its doors in 1998. They also have supported the Benaroya Research Institute at Virginia Mason Medical Center in Seattle and the Juvenile Diabetes Research Foundation, as well as many other hospitals, charitable, and arts organizations. Rebecca and Jack Benaroya were married for 70 years and have three children. They met as students at Seattle’s Garfield High School. Jack Benaroya was a pioneering real-estate developer and community leader who, in 1956, built The Benaroya Company which became the Northwest’s largest privately held commercial real-estate company and continues today under the leadership of his son Larry. Bessaroth, and the Stroum Jewish Community Center. Rebecca Benaroya continues to be an active community leader and arts patron, having served on numerous boards including the Pilchuck Glass School, Kline Galland Home, and McCallum Theatre in Palm Springs. She volunteered for over 28 years mentoring first- through third-graders at Sunny Sands Elementary School in Palm Springs. She is an avid bridge player. Seattle-based architectural firm Olson Kundig’s portfolio includes museums, commercial and mixed-use design, exhibit design, interior design, places of worship, and residences, often for art collectors. Tom Kundig is one of the most recognized architects in North America. He has received some of our nation’s highest design awards, including a 2008 National Design Award in Architecture Design from the Smithsonian Cooper-Hewitt National Design Museum; a 2007 Academy Award in Architecture from the American Academy of Arts and Letters; and a total of 37 American Institute of Architects (AIA) awards. Olson Kundig received the 2009 National AIA Architecture Firm Award (as Olson Sundberg Kundig Allen Architects) and has twice been named one of the Top Ten Most Innovative Companies in Architecture by Fast Company. Seattle-based JTM is a leading full-service general contracting firm in the Puget Sound region. Founded with a vision to be positively engaged in building the neighborhoods, work places, and infrastructure support systems of the Pacific Northwest, the firm specializes in the development of performing arts centers, medical facilities, office, hotel, retail, parking structures and warehouses. JTM and its team built the Frye Art Museum, McCaw Hall, and Benaroya Hall, along with our local Tacoma neighbors, Museum of Glass and Lemay – America’s Car Museum. Pilchuck Glass School was founded in 1971 by glass artist Dale Chihuly and patrons Anne Gould Hauberg and John H. Hauberg. 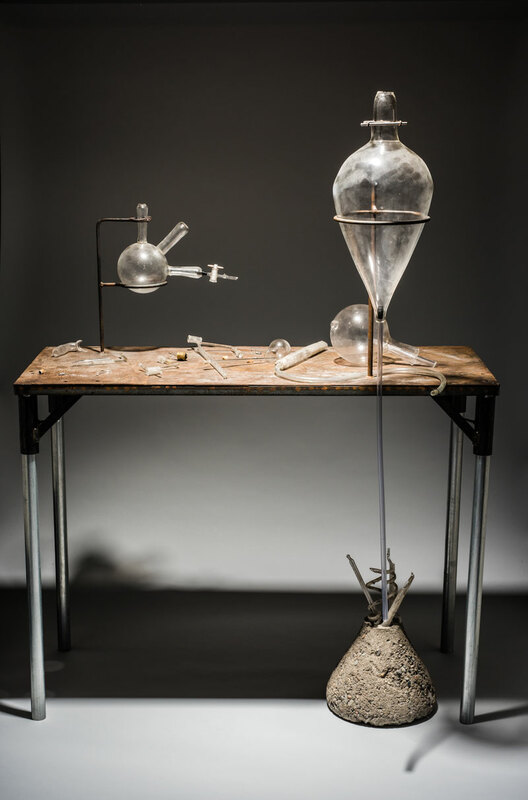 Pilchuck has been a primary force in the evolution of glass as a means of artistic expression. Over the past 45 years, thousands of artists from across the nation and around the world (49 states and 70 countries) have come to Pilchuck to teach, to learn, to test new ideas and to expand their artistic and creative horizons in the company of others with diverse perspectives and artistic modes. Pilchuck’s artistic and educational programs take place primarily on a 60-acre wooded campus 50 miles north of Seattle. By creating an environment with an emphasis on glass, access to resources, and an ever-expanding international community of artists, Pilchuck has become among the largest, most comprehensive educational centers in the world for artists working with glass. Tacoma, hometown of Dale Chihuly, is a unique city focused on the arts. The Bridge of Glass featuring Chihuly’s work links the downtown area and Tacoma Art Museum and its glass collection of nearly 1,000 works to the renowned Museum of Glass (MOG) on the Thea Foss Waterway. MOG’s vision as a signature glassmaking venue, shaping the future of glass, is realized each day with live demonstrations in the Museum’s Hot Shop, and with the impactful selection of innovative exhibitions presented in the galleries. The two museums are part of Tacoma’s Museum District, comprised of six distinct institutions. In addition, Tacoma’s other glass venues include Tacoma Glass Blowing Studio, offering hands-on opportunities and teaching glass blowing; Area 253 Glassblowing, also offering classes and Hot Shop rentals; boutique Hotel Murano, featuring curated glass art throughout the hotel; and Hilltop Artists, an educational program founded in 1994 by Dale Chihuly and Kathy Kaperick, transforming the lives of youth through the power of art, adult mentorship, and wrap-around services. With the recent promised gift of the Rebecca and Jack Benaroya Collection, this places Tacoma Art Museum into one of the top five public collections of studio glass nationwide with this focus. TAM’s Studio Glass collection continues to grow. The art glass movement is nearly synonymous with the Pilchuck Glass School in Stanwood, WA, founded in 1971 by Dale Chihuly, Anne Gould Hauberg and John Hauberg. TAM’s glass collection preserves and illustrates the history of how the Northwest became a world-renowned center for this art form; it is built upon key gifts from Chihuly, Hauberg, and Paul Marioni, who was a longtime instructor at Pilchuck. Celebrating over 80 years, Tacoma Art Museum is an anchor in Tacoma’s downtown with a mission of connecting people through art. TAM’s collection contains more than 5,000 works, with an emphasis on the art and artists of the Northwest and broader Western region, 25% which consists of studio glass. The collection includes the largest retrospective museum collection of glass art by Tacoma native Dale Chihuly on permanent view; the most significant collection of studio art jewelry by Northwest artists; key holdings in 19th century European and 20th century American art; and one of the finest collections of Japanese woodblock prints on the West Coast. In 2012, TAM received a gift of more than 300 works of western American art from the Haub Family Collection, one of the premier such collections in the nation and the first major western American art museum collection in the Northwest. The Haub family also contributed $20 million for an endowment and expansion completed in 2014. TAM is located in the heart of Tacoma’s vibrant Museum District which consists of six museums including the Museum of Glass, a frequent collaborator. artGuidemag is the top Washington gallery guide and art guide for art galleries in Washington. With a comprehensive, top Tacoma gallery guide and Tacoma art gallery directory, Tacoma art lovers will find no shortage of Tacoma art, Tacoma art galleries, as well as art museums in Tacoma. Be sure to use the top list of art galleries in Tacoma.